The last few months have left me with a rather positive feeling towards AMD. It's the plucky little upstart, which is trying to maintain some competitiveness against the might of Intel, and with the Piledriver update to its CPU lineup we're seeing some decent little budget chips. The FX-4300, though, is really testing that goodwill because I'm struggling to figure out what the point of it is. The original Bulldozer FX-4170 had the same dual-module, quad-core make-up and ran at an industry-leading 4.2GHz straight out of the box. I was also able to push it up to about 5GHz with some fairly rudimentary overclocking. Sadly though, with the FX-6200 being so close in price - roughly £15 more - there was little point opting for the quad-core chip when the six-core version offered similar speeds with an extra Bulldozer module. What was true then is just as true now. If it wasn't a literary impossibility I'd say it was even truer… there's just over a fiver between the price of the six- and four-core Piledriver CPUs, and that makes the weaker of the two essentially pointless. Like the FX-6300, AMD has opted to drop the clockspeed of the FX-4300 compared to the previous generation, so it now doesn't even have the pleasure of calling itself a 4GHz+ chip out of the box. It's still more than capable of achieving some impressive overclocking - I was able to quickly ramp up the clocks to 5.11GHz by following the same process as with the six-core chip - but even then it's lagging behind the FX-6300. And sadly, because of that slower clockspeed, it's also lagging behind the FX-4170. The whole point of the Piledriver upgrade was, well, to upgrade the existing lineup. The fact that, on the quad-core side at least, we're looking at a retrograde step is rather worrying. 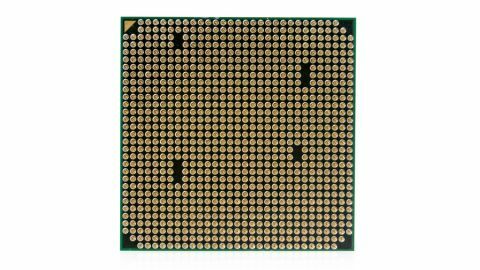 Yes, the architecture may have been improved beyond the original Bulldozer spec, but for reasons unknown, AMD decided to drop the speed of this part by 400MHz, hobbling any performance increase in the process. Again it's got a lower TDP at 95W, but then so has the hex-core, so it's not even like the quad-core chip can make more of a case for itself in small-form factor rigs. Had AMD decided to release this chip with more of a sensible price gap between it and the next processor in the lineup, there might have been a case to make for this quadcore Piledriver. At £70 this would have been tempting for the rig-builder on a tight budget - it happily outstrips the Ivy Bridge i3 in terms of multi-threaded goodness and can be pushed up to speeds that beat it in gaming terms too. The Core i3 is locked so it has no OC love to give, y'see. Sadly, AMD hasn't made a clear distinction between this and the hex-core FX-6300, and without a serious price cut we'd recommend anyone on a tight CPU budget to bypass the FX-4300 and look closely at the FX-6300 instead. In all honesty, this is a bit of a waste of good silicon.